This guide is brief, it mostly contains pointers to more information. Equipment and consumable quantities are for the bare-minimum end of the spectrum, which might not be appropriate for you or your objectives. It is useful to think of your trip in segments. Examples of segmenting might be: different modes of travel, resupply points, shelters, etc. What are the natural access/resupply points? Group-size logistics: When the group get’s too big, we plan as “Independent Nations,” expecting to travel together, but able to peel off separately. Food drops: In-person? Bear-proof containers? For each segment I make a best guess for pace and travel time, including weather days. The Munter method is a good example of Micro-scale pace calculation. I don’t use it, but apply the same general idea to longer segments. Another example. Brooks Range: Collecting information from friends about how fast we can expect to travel in tussocks, floating low-flow rivers, etc. I like down bags. I don’t have much trouble keeping them dry. If I’m cold, I boil water for a hot-bottle-cozy, a water bottle in an insulated case. The cozy makes a huge difference, maybe as much as 10 degrees. Sleeping pad: Thermarest’s NeoAir XLite and NeoAir Xtherm can’t be beat. We carry the stock repair patches, as well as Tyvek tape. For winter, the Xtherm is enough by itself, but I needed a closed-cell foam pad when I was using the Xlite. My biggest challenge is keeping the head of my sleeping bag dry. When possible, I wear my puff jacket and hood, hoping to catch as much moisture in the jacket rather than in the sleeping bag. Tje jacket dries out quickly during the day. Shelter: Tarp, Mid, Tent, Nothing? 2 – 3 lbs/person 4-season, high exposure. The Hilleberg lineup has performed incredibly well on our trips. My Nallo is ~8 years old, maybe 2000 miles, and still fully functional. 0 – 0.5 lbs/person summer, low exposure. I like the HMG tarp and Echo II. 1 – 1.5 lb/person 3-season. It would be tough to beat the cost/performance ratio of the Big Agnes Fly Creek . I tried really hard to like the Stephenson Warmlite, which can’t be beat for weight, but managing condensation was a deal-killer. We’ve used double poles to boost tent strength in high wind. You can replace pole shockcord with picture-frame wire and a modified bolt to create a backup snow probe. 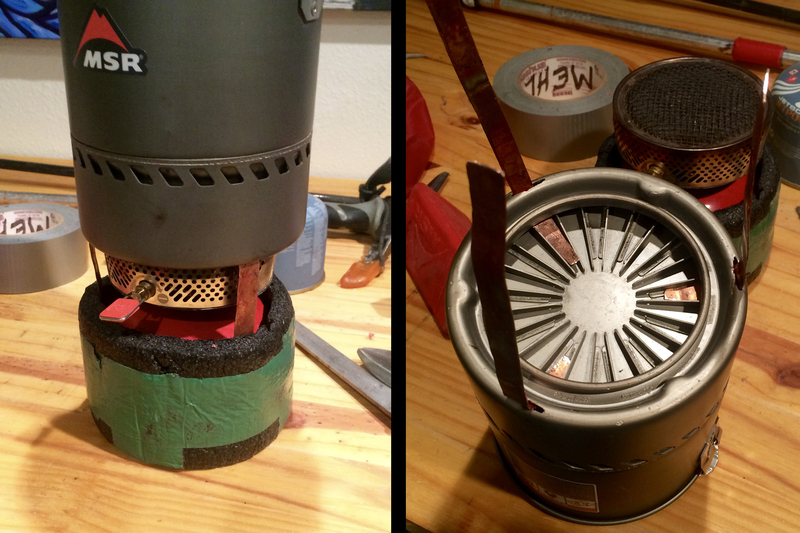 We are usually deciding between a MSR canister stove (Pocket/Micro Rocket, Reactor) or MSR Whisperlite/XGK white gas stove. You can use the “Water-Boiled (Per oz. of fuel)” information at the bottom of this guide to calculate how much fuel to bring. I often carry extra fuel as a way to justify bringing less insulation or a thinner sleeping bag. There are a few winter sprint trips where a canister might be the right choice, but you have to battle the frozen canister (the gas mix separates and partially condenses at ~25 F). Canisters with the most Propane and Isobutate in the mix will last the longest at cold temps; Butane is the killer. But all the cans seem to be about the same, and ratios change year to year. At really cold temps (-20 F), we needed to sleep with the canisters to get them to initially fire up. Several friends think their Whisperlites never recovered from running gasoline, so my stove is white-gas only. The XGKs have been bombproof. They are slightly more powerful, but much louder. Worth the weight for any trip over 6 days? Definitely in winter. We limit our fuel use to a minimum, melting snow and boiling water for dehydrated dinners, but not much else. Backcountry Ski Tour Repair Kit, from Graham Kraft, Fairweather Ski Works, and Eben Sargent, former engineer for Karhu and K2.